Do you know why? Because wants and desires lead to action. And actions lead to story. And that’s all a story is. That’s why action objectives are so important to characters, the actors that play them, and the writers that write them. Whether you have a main character who feels too passive, or minor characters who lack personality, action objectives are the solution. Lots of Great Tricks for Character Development! 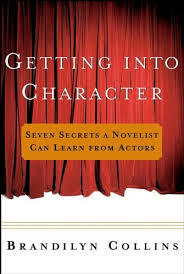 This is my second post about Brandilyn Collins’ very useful guide to character development: Getting Into Character: 7 Secrets a Novelist Can Learn from Actors. Using acting guru Constantin Stanislavsky’s “Method” acting techniques as a guide, Collins’ book is full of practical insights about the process of creating characters and character development. In my previous post, I explored Collins’ chapter on “Personalizing,” which focuses on part of the process that Method actors use—and that writers can borrow—to develop their characters. For more on this, and a longer discussion of why acting techniques are so useful to writers as they build characters, check out this post: 7 Secrets a Novelist Can Learn from Actors. Through study of a role, an actor must determine the character’s objective—the thing he strives for—both throughout the play as a whole and in each scene. The objective must be stated in terms of a specific action, that is, a verb rather than a general state of being or a noun. (For example, within a scene: “I want to hurry my roommate out of the door so I can have some time to myself” rather than “I want to be alone.”) This action objective will guide the actor in creating appropriate movements needed to carry out that objective. Before writing a scene, an author should first precisely determine the action objective of each character. In other words, what do the characters want to accomplish in the scene? These objectives should be specific to the situation and unique to the characters. Often, two characters’ objectives will be at odds with each other. These objectives will provide clear motivation for the characters, giving rise to believable dialogue, action, and conflict. Too often beginning writers have characters who are in pursuit of a vague state of being—they just want to be happy. But the truth is, until that happiness is expressed as a specific desire or projected onto an object, there is no story. Instead of “I want to be happy,” Collins, Stanislavsky, and Vonnegut encourage us to turn that desire into a specific action objective. Something like “I want to find my family (and keep them safe) after a the zombie apocalypse” (Walking Dead) or “I want to be President” (House of Cards) or “I want my dead son back” (Pet Cemetery). Already, with just these kinds of goals, story and character begin to emerge. Why? Because what a character desires is reflective of certain values, and those values, as well as the choices a character makes on her journey, tell us who that character is. Collins uses the example of John Steinbeck’s story, “The Pearl,” to illustrate the importance of making your action objectives specific. She notes that instead of just creating a character who wants to be happy, Steinbeck creates a character who associates a specific action with happiness: Kino wants to sell the pearl he finds for a large some of money because he believes this will make him and his family happy. What is so interesting is the way that this kind of specificity not only helps us understand Kino, but also helps us see the possible plot complications that will arise. Stanislavsky called this overarching goal or desire, the super-objective. The reason this super-objective is critical is because it lays the foundation for your character’s scene level action objectives. As Vonnegut said, all characters must want something, even if it is just a glass of water. Why? Because objectives such as these create clear motivations and set the course for believable conflict, dialogue, and choices within a scene. If there is one thing you fix about your characters, it should be this. You will be amazed at how many character development, plot, and overall story problems you can solve by simply clarifying the action objectives of your characters. So let’s put this idea to work. Do a quick scan of your work-in-progress. What is your main character’s overall desire, or super-objective? Now, is that super-objective reflected clearly in your main characters’ action objectives? If not, how can you make them more clearly aligned? What about your minor characters? Is it clear what they want? If it isn’t, notice how making it clear brings them to life! I know this isn’t necessarily the end-all-be-all of character development, but you never know. If you give your characters something to want, they might just give you something you want: A story! Does the idea of action objectives work for you? Why or why not? What other character development “hacks” do you use to bring your characters to life?